Them others. You know, those people who aren’t Us. In Gimli, there have always been two major groups of them others: the air force personnel, particularly the ones who lived in town and the summer campers. The campers weren’t camping as in living in tents. They had summer cottages and, sometimes, were called cottagers. Them there cottagers. The airbase when it was built because of WWII brought something that Gimli had little of, permanent jobs with wages paid regularly plus benefits. Gimli had been a village with commercial fresh water fishing as the main industry. Fishermen sold their fish to the local fish packing company and the fish was prepared and packed by local people. The fishing seasons were seasonal with long layoffs between seasons. Some families sewed on nets. This was hard, tedious work for as little as a penny and a half a fathom. There were some stores, a few cafes, a post office, a telephone exchange, a lumber yard, the train station, the local school, a movie theatre, a bowling alley, a municipal office, an RCMP office with one Mountie. In that mix there were some steady jobs with year round wages but businesses were family business. If non-family were hired, they were few and pay was minimal. The other source of income was the cottagers. They bought building lots, hired local carpenters to build cottages, hired kids like me to cut their grass, hired babysitters, got their hair cut at my father’s barber shop, bought fresh pickerel fillets (I sometimes rode around on my bike offering fillets at fifty cents a pound), but mostly kept to themselves. Town kids and city kids didn’t mix much unless the city kids were cousins. Part of the division was caused by the fact that many cottagers were Jewish and the town was mostly Icelandic Lutheran. The Jewish families didn’t want any summer romances blossoming and the townies were prejudiced enough that, for a time, there was a “gentleman’s agreement” not to sell to Jews. That was in spite of the fact that one of Gimli’s stores was Greenberg’s. Greenberg’s was a wonderful store, exotic summer fruit in the window, long and narrow, it was divided down the middle, dry goods on one side, soda fountain, candy, beyond the soda fountain, a few booths and tables and chairs where you could sit and slurp away your soda or milk shake. Greenbergs also owned the movie theatre where we went to watch Roy Roger and Gene Autry sequels. The tourist season in Gimli is short. Cottagers come out around the end of May to open up their cottages and shut the cottages down before school begins in September. When I was young, not many people owned cars. However, the railway came to Gimli in 1906 and that’s why my grandparents were able to have a small cottage where my grandmother could come with her daughter to escape the stifling muggy heat of Winnipeg and my grandfather could come down on a Friday night and return on a Sunday evening. Cottages were not the mansions of today. They were usually just a framed in box, no insulation, the studs still showing. There were no waterworks in Gimli so everyone had a backhouse. People got water from the artesian wells that were at nearly every corner. The cottagers were often resented. During coffee over many kitchen tables, chippy lips bitched about the cottagers. They contributed nothing to the town. They brought their groceries from Winnipeg. They didn’t patronize the local stores. They thought they were superior. They stuck together. They didn’t pay enough taxes. They sunned themselves on our beach. Some of the commentary was vitriolic. I watched my mother bite her tongue during these conversations. Making a living in Gimli was difficult. My father got up before dawn during fishing season, went out to his nets, took his catch to the shed, iced it, came home, washed, got dressed in a suit, went to the barber shop, cut hair all day long, came home for supper, changed into his fishing clothes, dressed his fish, in hot weather might go out for a second lift. To feed, clothe and house us, he worked all the time. He particularly worked long hours in the summer because come winter time, he might be lucky to get one or two haircuts a day. Some of those would be on credit. The campers filled the chairs in his shop and they paid cash. My mother carefully managed the nickles, dimes, quarters, dollar bills that he brought home. His business wasn’t much different from that of other local businesses. The winter months were hard months. Business was always slow. That didn’t keep some people from constantly complaining about the cottagers. Gradually, people bought cars. Train service stopped. Today, there is no train or bus service. With so many people owning vehicles, a third group now comes to Gimli, particularly on weekends when there is good weather. They’re the day trippers. Many of them, from my observation, are Asian, particularly Filipino. That’s not surprising since the Filipino population of Winnipeg has grown exponentially over the last decade. They are inclined to do things as a family group, sometimes three or four vans full of people. They park at the beach, set up BBQs, spread blankets, relax and enjoy themselves. I see them with a touch of envy and wish I knew some of them well enough to be invited to join them. We used to get together like that at the beach before our family got spread across the world. Uncles, aunts, cousins, grandparents, parents, all of us cooking wieners and hamburgers over an open fire at Willow Island or at Midas. Lounging around on blankets. Drinking cold beer and home made lemonade. We don’t do it anymore. The people who bitched and complained about the air force personnel, who resented their presence, got what they wished. The airport was shut down, turned into an industrial park that, once the government transition grants ran out, turned into an industrial park wasteland. The good jobs with steady wages and benefits disappeared. There is still some griping about the cottagers, although many of the cottages are being bought up, torn down so that permanent winter homes can be built. Some of the people doing this are retiree cottagers who have decided to move to Gimli permanently. The complaints are the same, they use the beach, they don’t spend enough money in town, they don’t contribute to the life of the community. Most of it is still just an expression of resentment about other people having more money or taking up parking spaces. Jealousy coats a tongue with bitterness. How important are those day trippers? Who benefits? Put up a gate at Highway 9 so only people paying taxes in the municipality can enter and what businesses go under? There are two gas stations. I expect one of them would quickly disappear. There are two coffee shops. One might survive, maybe. The Kaffee Haus does a roaring business in summer. It employees a lot of locals. In winter, not so much. Chicken Chef? How much of their business is transient? When I’ve been here in winter, there are a lot of empty booths. The Oldie, that is the old hotel, has survived for many decades. As a kid I used to go with my friends to watch the drunks fighting outside. It’s café was busy the other day. Looked to me to be all summer people. The Dollar store would probably survive. It sells inexpensive stuff that isn’t worth driving to Selkirk for. Tergesen’s, Gimli’s most venerable store, built in the 1800s, containing a fine book store on one side and a top quality clothing, souvenir store on the other. Gone. The pizza place and the Chinese café close to the dock. Gone. The Lakeview Hotel. Gone. Some of the ground floor stores might survive in other locations. Robin’s Donuts, gone, for sure. The art gallery at the harbor. Gone. Kris’s Fish. Gone. Tip Top meats and groceries. It would probably survive. It has survived everything for around a hundred years. Day trippers don’t buy there much but cottagers do. Whitecap restaurant? Maybe. The Beach Boy, famous for its pickerel dinners with summer lineup that go out the door, down the stairs, along the sidewalk. Business is so slow in winter, it shuts down. Gone. The museum? A slow death. Government grants would keep it on life support for a while. The Gimli Theatre. Probably would survive. Day trippers don’t go to movies. It’s patrons are locals and cottagers. A-spire Theatre. It seems to be kept alive by those damn cottagers, you know, the ones who use up parking spaces, not day trippers, so it would be okay. Amma’s Kitchen, gone. Am I one of those detested interlopers, taking up good beach space, polluting the dock, cramming into popular spots like Brennivin’s Pizza Hus which seems to be the most successful restaurant in town. It stays open all year. It would survive. Does the fact that I was born here, grew up here, but left in 1957 to go to university and only come back for the summers make me one of THEM or one of US. Is it okay if I use the benches at the beach? Would it be okay for me to have a BBQ with some friends on the grass under the trees? Does the fact that I buy my groceries at Tip Top, Super A, Sobey’s, the Fresh Carrot make a difference? That I buy my gas at the Husky station? That I buy books and Viking helmets at Tergesen’s. That I eat a lot of pickerel dinners at The Beach Boy? That every year, I spend around $12,000.00 for my three months in Gimli. Is there a threshold that makes someone non-bitchable about? People who spend X amount are welcome and those who spend less than that are not? Would I get a pass card that would unlock the gate at Hwy 9 and Centre Street? It’s an old conflict. Us and Them. Tribal, I guess. 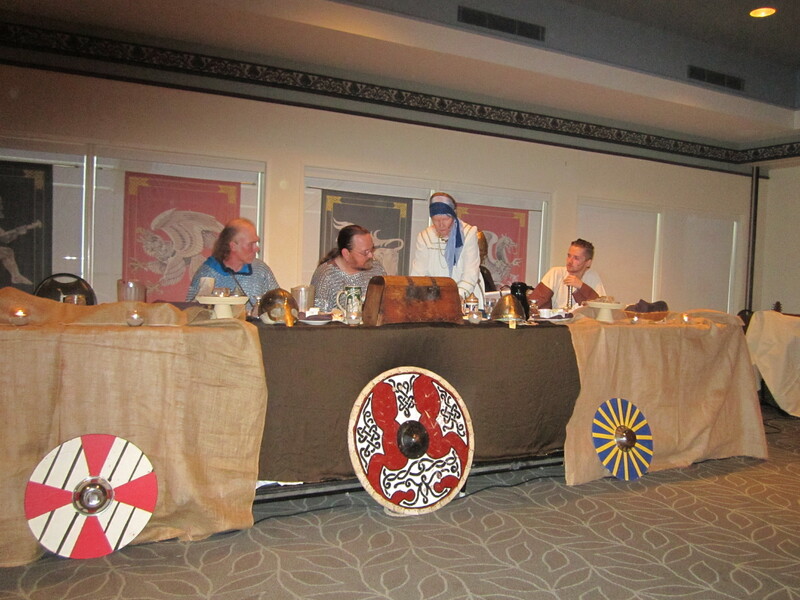 I risked attending the Viking feast in Gimli. It is the New Iceland Heritage Museum’s annual fund raiding gala. I wasn’t sure it was being held in the Lakeview Hotel but about twenty feet from the door, I could smell the Icelandic hardfish and I knew I was in the right place. Sure enough, just inside the door of the banquet room, there was a large platter of flat bread and another of dried fish. On the way to the feast, I stopped in Tergesen’s and bought a Viking helmet . I thought there would have been a forest of viking helmets but I was the only male in the audience with appropriate head gear. Good thing I didn’t go full bore and turn up with a sword, battle axe, and chain mail. I think the lack of Viking helmets was because the audience was older, respectable, could afford forty-five dollars for a ticket, five bucks for cutlery, ten bucks for the silent auction, twenty bucks for booze. That’s eighty bucks and if you are twenty years old and making minimum wage that’s more than a day’s wages. You are more likely to be serving the food than eating it. We were told there was the danger of trolls appearing so I bought a rune stone. There also were rune stones on the tables. The stones came from the local beach. I thought back to some of the trolls I worked with over the years and wished I’d thought to paint runes on stones from Gimli beach to protect myself. The evening began with the blowing of a horn. We had a welcome in verse to the village by the Skald (Nick Burdey), remarks by Jarl Ragnar of the Red (Dean Bjornson), toast to the Jarl by Torgeir, the Swedish right hand of the Jarl (Terry Vezina), lots of Skols,(the two best were to Tammy Axelsson and to the kitchen wenches), the Warrior Bard who was sabotaged by the musical equipment when he went do his barding (Ari Jakobson), the Spa Kona (Helga Malis) who every so often rose to pronounce wise Viking sayings. I opted to pay for a knife, fork and spoon. I guess I could have drunk my soup from the bowl, eaten my potato and carrot and ribs with my hands, which would have been more authentic, but terribly messy so I ponied up a couple of bucks to eat like the English. As part of the entertainment, there was an airing of grievances, the funniest one being the grievance registered to the MP of the area because Edmonton has direct flights to Iceland and the trip from Winnipeg to Edmonton is too long. The request was that the MP ask Parliament to get rid of Saskatchewan to make the trip shorter. There was also a settling of accounts and the risk of having to wear the Viking helmet of shame, a helmet with large horns decorated with flowers. I must say that Bill Barlow made a great Troll even though his nose kept falling off. I couldn’t eat the dessert of Ponnukokur or the rocky troll bits that were sponsored by Gimli Super A Foods. It is obvious from the program that that the Vikings plundered many local businesses so they could have their feast. I won some of the plunder in the silent auction and now have a box full of attractive items from Amma’s Kitchen. Once the feast was over, people donned Viking costumes to wear for photographs. Gimli Life: drove into Winnipeg yesterday to attend a book launch for David Arnason’s new collection of stories, There Can Never Be Enough. Had supper at the Prairie Ink restaurant that is part of McNally Robinson bookstore at Grant Park. Jim Anderson, that writer of all things Labau, stories and poems of marshes and fishing, bookseller of extraordinary Icelandic Canadian documents, organized a table of writers and editors so conversation before David’s reading was lively and interesting. Filing the other tables were relatives, friends, colleagues, admirers, fans. For me it was a chance to meet and chat with people I might otherwise not see during my three months in Gimli. Linda Sigurdson Collette was there, sitting with the Consul General Hjalmar W. Hannesson and his wife, Anna Birgis, and when David and I and Hjalmar were getting our pictures taken, got us organized so David’s books were front and centre. 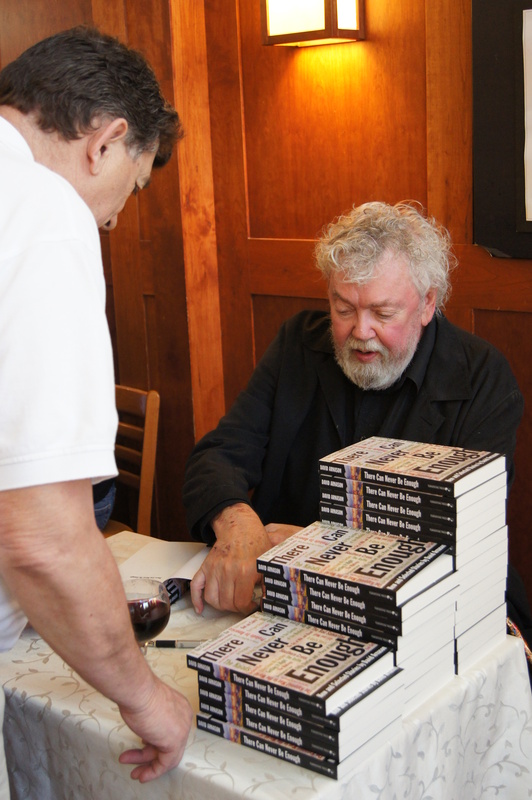 It was a happy crowd and the Prairie Ink restaurant is a happy location, its staff used to the vagaries of writers and fans, used to having service cease while an author is introduced and gives a reading and, hopefully, signs large towers of books hot off the press. David’s new collection was so hot off the press that it had just arrived from Turnstone Press two hours before the launch. There’s a nail biter for you. David and I went to the Gimli Collegiate together. Not surprisingly, given his family’s penchant for discussing saga characters as if they lived on the farm just down the road, he became a teacher of literature. While I and my new wife went to Riverton in 1961, David and his new wife (it was a time of new wives and husbands and we were shockingly young) went to Arborg so he could teach literature there. Our paths crossed again, when two years later David and I bought taught at the Transcona Collegiate. I went off to teach in Snow Lake and scurvy and David, much more sensibly, went on to earn a Phd. During those years, he was learning about Canadian literature and honing his craft in the writing of fiction and poetry. Like many members of the Icelandic Canadian community, like a moth attracted to the flame, or an Icelandic Canadian from the Interlake, attracted to Lake Winnipeg and vinartera, he returned to teach at the University of Manitoba. He had a house in Winnipeg and a cottage on Willow Island with, as I remember vaguely, some amazing literary beach parties. He was part of and central to the growing canon of Canadian literature, Manitoba literature and, particularly, Icelandic Canadian literature. He has taught for decades and, as a result, has had a large influence as a teacher, writer and editor on hundreds, if not thousands of individuals. His CV would take a strong man to carry. When all these external successes are set aside, the position of acting Head of the Department of Icelandic Studies, the head of the Department of English, all those well deserved rewards for hard work well done, it is his writing, particularly his short stories that best define him. He is a fine reader with an excellent sense of timing. I have heard him read his work many times and, each time, it is a pleasure for his stories are filled with truth and laughter. Years go by and a chapter from a novel (his chapter on the problem of his family’s kissing all the time, I will never forget) or a short story will spring to mind and I’ll chuckle to myself and people nearby look around to see what it is that I’m laughing at. David’s reading last night was like that. He read a story about square dancers and the questions their existence raises. The story was delightful, laughter rippled through the room, I look forward to taking There Can Never Be Enough out into the sunshine and sitting and reading it and laughing out loud no matter how many strange looks I might get. This was one of those “You should have been there moments”. Driving back to Gimli (it is an hour and a half each way), I was pleased that I had gone into the city to hear David and to see people in the crowd whom I hadn’t seen for a while. Gimli, Manitoba has always been about commercial fishing. However, it is often pointed out that the Icelandic settlers who came to this area in 1875, in spite of terrible poverty, brought books in their trunks. 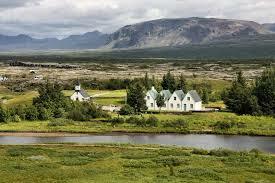 We know that is true because books in Icelandic seem to be everywhere. Jim Anderson specializes in finding homes for them. It is said that every Icelander and every North American of Icelandic descent is determined to publish a book before he or she dies. From the number of books published in the Icelandic Canadian community that also seems true. David, with his place at Willow Island, the very place where the first Icelandic settlers landed in 1875, represents a great tradition. I had my camera and new zoom lens stolen, my car window smashed but at least I didn’t have three dimwitted teenagers pump me full of bullets like the armored car employee in Toronto. There is not a large gap between breaking into cars and stealing or knocking over the local corner store or going for a big score with an armored car. These actions don’t usually come without a history, although the police say the three alleged culprits had no previous record. That may simply be that one of them was just smart enough to observe the obvious. “You will probably get caught,” comes as a suggestion that seems quite impossible and can be mitigated with a paper bag with eye holes pulled over the perp’s head. The linear thinking doesn’t allow for analyzing past experiences of bakery-holder-uppers. Doesn’t mean researching the fate of bank-holder-uppers as being caught within fifteen minutes of a robbery. Doesn’t mean finding out how much money is in a bakery till on a Friday night and matching the proceeds against the consequences of armed robbery, or attempted murder if the baker decides to fight back. I use the example of the bakery hold up because many years ago, the bright lights in one of my classes decided they were going to finance a hot weekend this way. Knocking over an armored car is a step up. There’s a lot of money. The guards are armed. They can communicate with the police. Frankly, the risks are so great that I can only vaguely remember an armored car being knocked over somewhere in the distant past. It’s more the stuff of movies from the nineteen thirtees and forties. Maybe the alleged perps watched a lot of black and white movies and said, “Yeah, that’s the way to go.” I wonder if they searched through thrift shops to find old fashioned felt hats, had cigarettes in the corner of their mouths as they lurked about. Obviously, they must have cased the joint, does anyone say “cased the joint” anymore? Of the three alleged perps, one must have been smarter than the other two. That’s usually how it works. The smarter guy (I didn’t say smart) will have concocted a plan, explained how it would work, the bountiful rewards, will be the leader. If the guard hadn’t been shot, if the charges weren’t so serious, if the likely sentence wasn’t so long and the brains behind the operation was back out on the street, I know exactly what he’d be telling his potential gang. Bad luck, it was all bad luck in an unreasonable world. We’ll do it again and we’ll be luckier this time. The ability to think cause and effect won’t have been improved. They would have been better to stick to property crimes. There are so many of them, that trying to report one to the Winnipeg police on the phone means waiting for an hour or so to get one’s turn. There are so many property crimes that the police force has resorted to having victims report on line. The police do their best but they’re like King Canute trying to drive back the ocean waves by beating them with a chain. Manitobans need to pay more taxes, need to hire more police, give them more equipment and while they do their best to hold back the tsunami of lower level criminality, pay yet more taxes to remedy the social ills that foster crime. Of course, this is theft at its most basic level. Maybe I am being unfair. Maybe the perps are well read. Maybe they’ve read of all the theft at the top of the financial chain, millions and millions, if not billions, with no consequences, white collar crime, and thought they should get some of the loot before it all disappears.